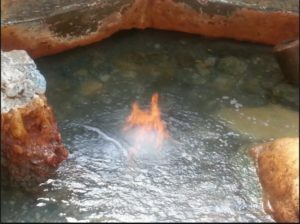 In Jamaica located in St. Ann’s Bay, you’ll find a mysterious phenomena known as Firewater Mineral Springs, or simply “Firewater”, as the locals call it. Firewater’s origins are said to date back to slavery. The mineral waters are said to be so healing, the locals come at all hours just to soak in it. And there’s something else about this relatively unknown springs… fire burns easily in the water! I first discovered Firewater on a trip to Jamaica with my mom. Another traveler at our hotel whom we befriended had heard amazing things about the springs. The few people who’d heard of Firewater told anecdotal stories of miraculous healing after people had soaked in the springs. The mystique surrounding Firewater had me intrigued, and I managed to convince my mom that we had to experience this. My friend tracked down the same driver who’d taken her friends to Firewater the year before. This was key because at the time, few people we’d asked even knew this place existed. Plus, the mineral springs were almost impossible to find, even for a Jamaican, if they haven’t been there before. It’s nestled deep in a rural community, and it’s literally off the beaten path. We took winding dirt roads with only trees for landmarks to get there, but the trip proved to be well worth it. The rastafarian guide who greeted our group at the gate was kind and friendly. We had an option to soak only, or soak and get hot towel massages, so we chose the massages. There were several people who did the spa massages and they were expert! While we soaked, one of the massage therapists struck a match and lit a small portion of the water on fire… and it stayed lit! We soaked in the warm mineral springs and watched in utter amazement as the flames danced around us in the water without burning us. It made for an incredible heat therapy. While I soaked, one of several massage therapists doused a towel in flames, flanked it out, then put the piping hot towel on my mom’s back! The heat penetrated deep into my mom’s back without burning her skin. These guys were experts. Within a few minutes of the hot towel massage, the massage therapist had my mom loosened up like Gumby! Somehow, the combination of water, heat, minerals and therapy relaxed her arthritic muscles like never before. I watched as her massage therapist easily stretched her body into Circque-du-Soleil type positions for maximum flexibility. It was beyond incredible. We each had our turn being stretched out like rubber bands. I’d never had a massage therapy like that, like ever. The massage and stretching techniques used by our masseurs felt more like functional physical therapy. My guy loosened out kinks I didn’t even know I had. While we got our spa therapy, the guide told us about the history of firewater. Apparently, runaway slaves would make their way to the Firewater springs and would soak in it to heal their bodies before heading on. At the end of our spa session, we were asked to take a leap of faith and walk through the water where the flames were burning. We each did it without getting burned. For me it was scary, but exhilarating when I finally did it. I felt a little heat but nothing serious. My aunt who was with us had rheumatoid arthritis in her knee. She later told me her knee never bothered her again for years after she left. As for me, I had a very bad case of eczema on my wrists, and I used to wrap them in colorful bandanas to hide the unsightly rashes. When I asked if the water might help the itching, the guide rubbed wet sand onto my darkened wrists for a few minutes. He told me the sand from Firewater Mineral Springs has powerful healing minerals that have cured many ailments from eczema to cancer. The next day the raised bumps started to diminish. By the time I left Jamaica days later, the eczema had all but stopped itching, and the bumps had flattened out. Within weeks, the eczema was all gone and to this day, it has never returned. I’ve been back several times and have referred friends who also enjoyed the experience. Firewater is one of Jamaica’s hidden gems and is truly something special. The next time you visit Jamaica, be sure to go to Firewater Mineral Springs. You can stay in beautiful Ocho Rios, and you’ll be 15 minutes away from St. Ann’s Bay – that’s where Firewater is located. You’ll also need to find a driver who can get you there. Try checking out Trip Advisor for driver recommendations from those who have been there. My advice is to go during a weekday to avoid any wait time. If you go on the weekend and have to wait, you can play a lively round of dominoes or sip some Jamaican beverages there too. The community of people there are kind and loving and the kids will gladly entertain you, if you have to wait. If you have chronic ailments and are planning a visit to Jamaica, give Firewater a try. It cured my eczema!